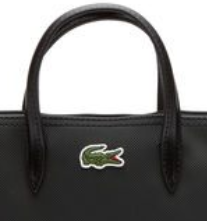 Here’s a simple four step process for detecting whether the women’s Lacoste tote bag or purse you are buying is a genuine Lacoste or a cheap fake. Start with where you are buying the bag. If you bought the bag from a street seller or from a eBay, you can be almost certain that it’s a fake. 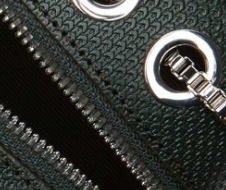 Lacoste bags are only sold at Lacoste’s own stores or at certified retailers. You can determine if a store is an approved seller by checking it out on Lacoste’s website. Is The Quality Of The Construction And Materials High? 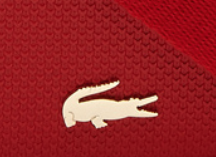 Is The Lacoste Logo Correct? Sometimes, as shown below, the monochrome logo matches the bag’s material. Does The Bag Reflect Lacoste’s Design Sensibility? If you browse through the Lacoste website, you will soon become familiar with Lacoste’s design sensibility. 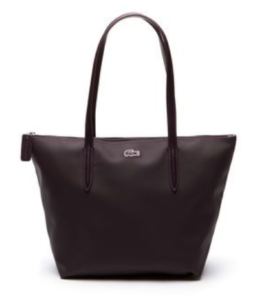 Lacoste tote bags are all narrower at the bottom than the top, and have large U shaped straps. The logo on the bags is usually at the top and centered. The leather bags don’t come in outrageous colors, and the purses also have very traditional designs. After you have looked at a few examples, you will have a good idea of whether Laooste would have designed the bag you are looking at buying. I hope these tips are helpful, and that they will prevent you spending your hard-earned dollars on phony merchandise. This entry was posted in Acessories, Bags, Real or Fake Lacoste and tagged Bags, Counterfeit, Fake, Fakes, Lacoste, Phony by JFP. Bookmark the permalink.